Life is a long distance run. 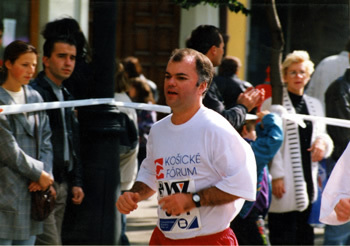 Here I am halfway through my first marathon in Kosice, Slovakia. I have been fortunate in my travels to make many friends, but I've also realized how difficult it is to keep in touch, particularly as I embark on further adventures. So, I hope that through this web site, it will always be easy for you to track me down, to find out what's new in my life, and to learn what I've been up to. I love to write, and for those interested in a few moments of diversion, I hope to share through this site my stories and essays. I have been blessed in my life with many interesting experiences, and have picked up pen so that I can relate them to you. Just click on the links at left to join me on my literary excursions. Currently, I am working as a consultant to several different non-profit organizations. It's good work providing me a chance to be of help to a number of worthy and interesting causes. With my good friend Alberto Mora, I am also happy to be pursuing another passion of mine as co-organizer of the Love & Responsibility Foundation. We organize discussion groups that explore the wonderful teaching of Pope John Paul II on love, marriage, and sexuality. We also run a Pre-Cana marriage preparation program in New York City. It has been truly rewarding working with couples as they prepare for that momentous walk down the aisle. That's all for now. I'll be adding more over time. In the meantime, I'd love to hear from you, so please when you have a chance and I'll write back as soon as I can.